John Kerry warned that if his latest peace mission is unsuccessful, Israel will be isolated, according to columnist Jeffrey Goldberg. 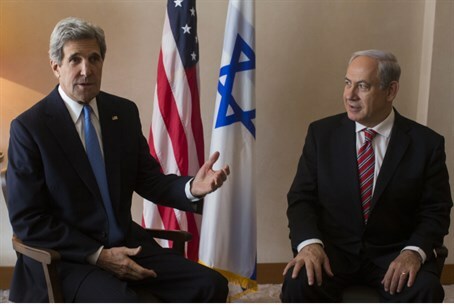 U.S. Secretary of State John Kerry recently warned Prime Minister Binyamin Netanyahu that if his latest peace mission is unsuccessful, Israel will be isolated. According to Bloomberg View columnist Jeffrey Goldberg, Kerry capitalized on Israel’s anxiety over the European Union’s new guidelines which boycott Israeli entities that operate from beyond the 1949 Armistice Line. Kerry, according to Goldberg's latest column, has warned Netanyahu in recent weeks that if the current peace talks bear no fruit, Israel may soon be facing an international delegitimization campaign -- in his words -- "on steroids." Anonymous officials cited by Goldberg said that Kerry thinks the one thing Netanyahu fears as much as Iran's nuclear program is the growing power of the international movement that seeks to isolate, scapegoat and demonize his country. “Although Netanyahu is worried that the campaign to make Israel appear to be an illegitimate state could hurt the country's robust economy, he is said to be even more worried that this campaign will erode Israel's ability to defend itself,” wrote Goldberg. “The theory is simple: A country seen as illegitimate, not only by the powerful Arab lobby at the United Nations but also by Western powers, will have little standing if it is forced to retaliate against sustained attacks from groups such as Hamas and Hezbollah, both of which remain committed to Israel's extermination. Netanyahu thinks that the campaign to delegitimize Israel could force Western powers to rein in Israel, or at the very least, rush to condemn it before it has the chance to defend itself,” he added. Goldberg is considered close to President Barack Obama. Several days before the last Israeli election, Goldberg wrote that Obama "has become convinced that Netanyahu is so captive to the settler lobby, and so uninterested in making anything more than the slightest conciliatory gesture toward Palestinian moderates, that an investment of presidential interest in the peace process wouldn’t be a wise use of his time."